We visited Saud beach for the first time before summer of this year and arrived late noon. We really never thought of being entertained with the view, what we only thought is getting rested and just prepare ourselves for the nextday. 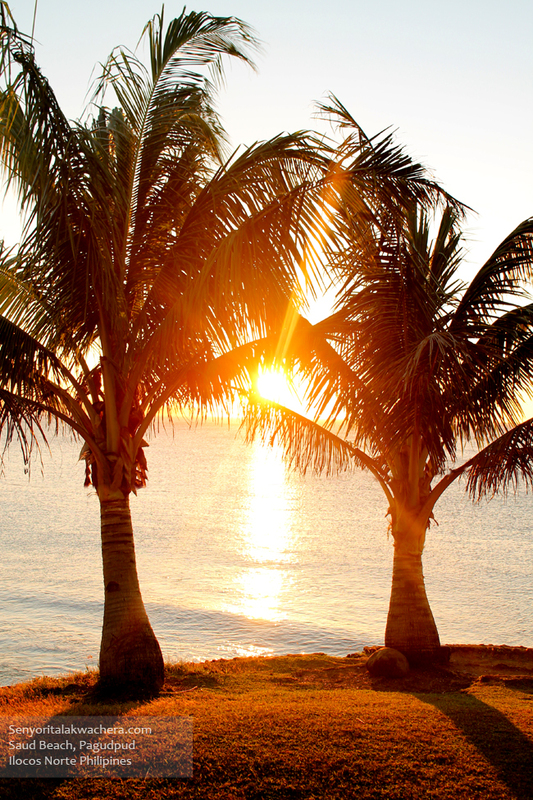 We were surprise that the owner of the homestay is eagerly convincing us to go down the beach and witness the sunset. She is so persistent and convincing – she sounds like selling something really nice and cheap. 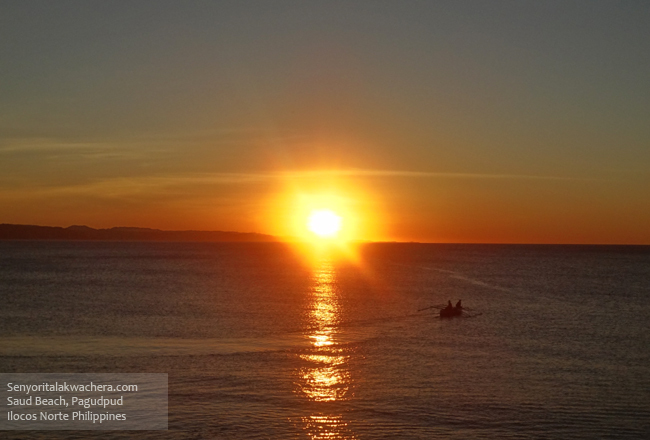 We went down in interest and walk across the road down to the beach at exactly 5PM just right on time while the sun still in full circle and approaching the horizon, we are surprised and astonished to see the incomparable beauty of sunset in this side of the island. A bewitching feeling covered us while standing in front of a perfect ball of fire that is approaching to touch the horizontal ocean surface, illuminating the water with its golden rays. Some fisherman’s boat passing left and right like a float in a parade as they sail smoothly; at the left side are little windmills in perfect row – at far it seems that its rotor blade were rotating gently and gracefully while being blowned by the cold and calming breeze of the air from the far atlantic. Tell me this is not worth the travel? We only had a day here since we already booked a room at the opposite beach which is the Blue lagoon. But the one hour experience is something you can treasure for a lifetime. Thanks to Ate Mariefe for the encouragement. Going back to the real world, this beach is located at the northern edge of Luzon two hours from Laoag City where the nearest airport is located. 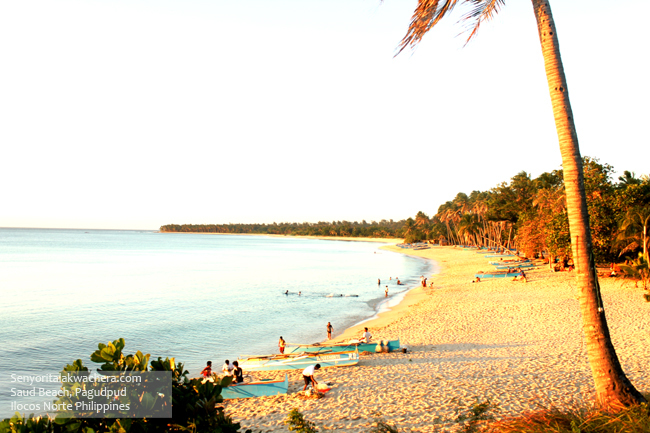 It is also compared to Boracay due to its white sand beach stretching in a kilometer long. But this beach creates a huge difference especially on the experience that it can offer. Saud beach is one of the best beaches to go for a summer vacation or travels when you aim to experience the best taste of rustic Philippine water. Saud caters a long white beach with no colored stains of garbage from end to end, green blooming coconut trees aligned the entire coast, local home cooked food that will let you taste the culture and the local’s way of living, lesser crowd and an affordable accommodation that offers nothing but a tranquil traveler experience. From Vigan we took a bus from Bantayan to Laoag. The two hour ride cost us Php 120.00. From the terminal where the bus dropped us, we took a tricycle going to another bus terminal this time bound to Pagudpud. 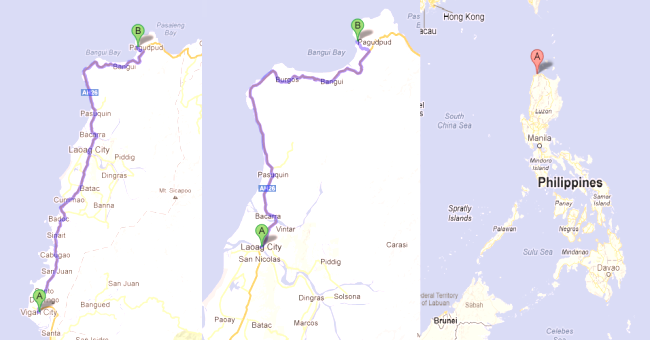 It is another 2 hour worthful ride that cost Php 60.00 each. We got off from the bus in front of Pagudpud Municipal Hall where numerous tricycles are waiting to be hired. Since the owner of the homestay that we contacted has a tricycle, the ride to the Saud beach was for free – a very kind deal. Hi! Can I ask for the home stay you were referring to this post? I'm going to Saud beach, thought I could contact the homestay. Thanks!